I am definitely running behind on the blog, as we have been home a week already and still have not completed our journal of our trip to Georgia. I am behind because as soon as we returned home, we began our role as grandparent care givers to Victoria and Nico. Our daughter had to return to her second grade classroom, so we have started watching over our grandkids until Nico is old enough in our collective minds to start daycare. This is enjoyable but somewhat tiring duty. It is very clear why young people have children, they have the energy to keep up with them. Back to our travels in Georgia. After leaving High Falls State Park, we entered the Atlanta Speedway grounds and were parked by a very well organized parking crew directly outside of turn one. We were going to share the activities with around 5000 fellow Good Sam members . There was a lot of new model RV's available for rubbernecking along with a number of used units. 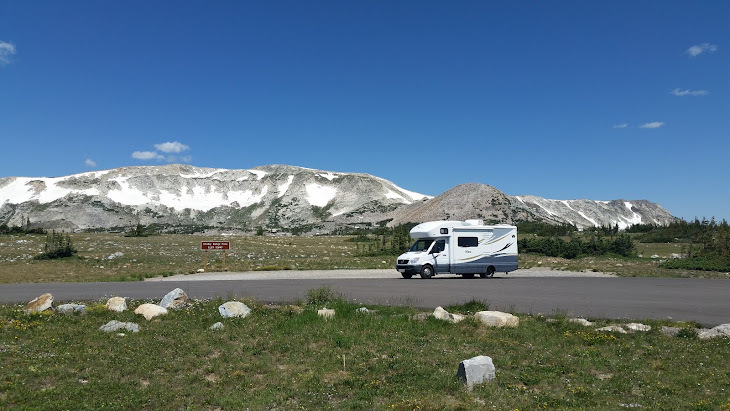 There was a large Camping World store (owned by Good Sam) along with two additional buildings full of vendors selling all the latest RV gear they hoped we could not do without. We sat in on several of the seminars with Anneke particularly enjoying the one by the Food Channel chef Bob Blumer She even bought one of his books. We just happened to catch a show by a dog training group called the K9 Kings flying dog show. It was very interesting and the dogs were indeed well trained. I fear there is no hope for Halley in that regard. Her only chance is if they had a category for most spoiled. The main attraction for us was the entertainment. The two headliners were The Beach Boys and Vince Gill. We enjoyed both shows. On Saturday, the sunset over the speedway was really wonderful. After sundown, there was a nice fireworks display viewed from the grandstands. This was our second Good Sam Rally and we found both to be well organized and enjoyable. Our first stop after spending time with family was High Falls State Park. This was our planned staging stop for being able to arrive at the Good Sam Rally at the Atlantic Speedway in Hampton GA for the designated AM arrival on our appointed day. The park is an easy access of the interstate and would be a good overnight stop. It has a scenic cascading falls and hiking trails. The river campground is roomy with many of the spots level and long. We will certainly stop here again if we need a spot to spend the night south of Atlanta. After leaving the Blairsville area we headed to our daughters home north of Atlanta for a visit and some quality time with our grandson Aleister. On the way, we hit some amazing traffic on back country roads and realized we were in the middle of the apple production region of Georgia on apple festival weekend. So rather than getting stressed out, we made a few stops to get in on all the excitement. At one stop there was a large crowd including another Winnie View, so we knew we must be in the right spot. There were apples everywhere and you could purchase some in any quantity you had in mind of varieties that I have never even heard of along with all the ones you will find in the supermarket. We made our apple selections and had our first ever fried fruit pie. Speaking for myself, even though it was well made, it will likely be my last. I think I enjoy my fruit better in its natural state. Once we arrived at our daughter's home and set up in the driveway, we quickly all agreed that the first thing we would like to do was visit the local Prater Mill fall festival. This is nearly an annual event for our daughter's family and would be our second visit. It is a reasonable large affair at a historic water driven mill just a short drive from their home. We did the tour of all the craft booths and found a number of great items, we while we enjoyed looking at them were able to resist adding them to our collection. Anneke continued her food experiment with a baked apple pastry and it was a big hit. We then headed to the old cars , tractors and assorted other items to see if there was anything here we had to have. Luckily, there was not! Aleister and his dad did enjoy a quick "train" ride around the premises. Finally, we were about ready to head home, when we had to pass the Humane Society booths. Aleister's dad spent a lot of time looking and talking with the helpers and the next thing I knew everyone was looking over this rather impressive looking Alaskan Husky. He was a very cute dog, but there were some issues. 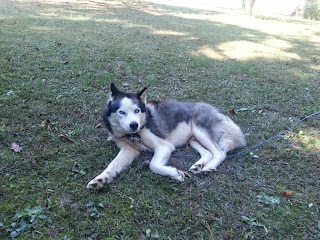 He was found on the streets just a short while ago with no know history and he had heart worm disease. He, of course, had been given all his shots and neutered per society policy. 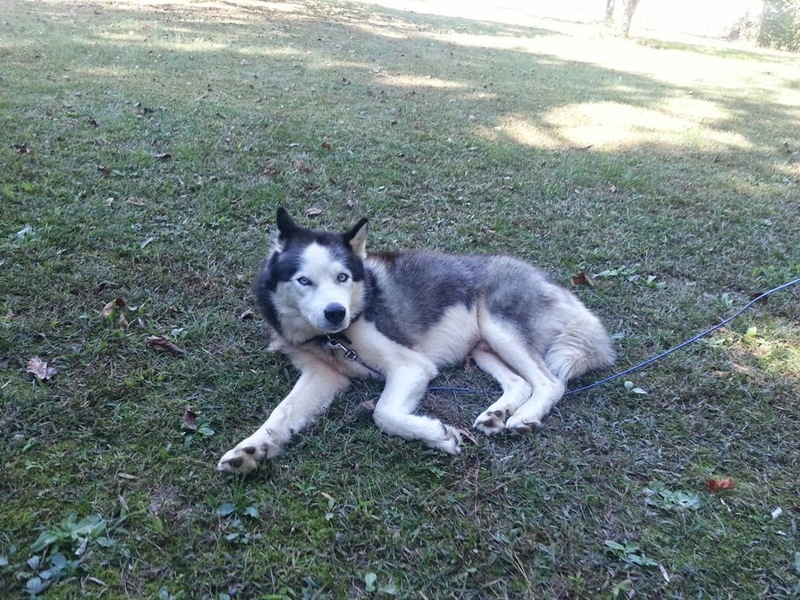 They also said that "Blue" had been treated for the heart worm. So after much discussion, we were trying to figure out how we were going to get this large dog in to the cab of a pickup along with the five of us. Let's just say it was a tight ride home. Blue proved to be a good natured dog and did not seem overly alarmed at his change of circumstances. He quickly settled in at home as part of the family. 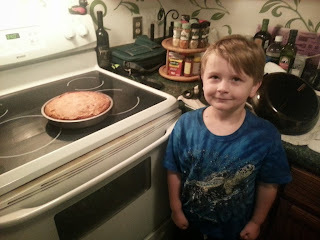 Aleister also had another first this weekend, as he announced that he wanted to learn to cook and the first thing he wanted to make was a cherry cake. So with a great deal of help from his mother, he completed his first project, which I can personally attest to as being excellent. Now for the rest of the story. Our daughter decided that she had better have the dog checked by a Vet first thing Monday. When the Vet examined Blue, he found that the heart worm was still active and wanted to keep the dog until he could confer with the Humane Society. Long story short - the Humane Society, at best, mislead them about the treatment. In fact they lied to them. What they told the Vet was that they could not afford the heart worm treatment and had simply given him a double dose of the preventive heart worm pill. After we left, the family decided to keep the dog and pay to have the expensive and tricky treatment done. We can only hope this will have a happy ending. As for the Humane Society, they have moved way down my list of good guys. We have spent the last three days exploring the area around Blairsville, GA. This a fast growing resort and residential area in the Blue Ridge Mountains just south of the North Carolina border. It is a rugged and beautiful area with lots of things to do. We are staying at a resort designed to be all owner occupied. Unfortunately, the first operator went broke and I am not sure about the second. It is a beautiful spot but they have not done much with it. We would not consider buying here with the current conditions, but is had been a fine place to spend a few days. Our first outing consisted of a loop trip through the mountains enjoying the views and getting a feel for the area. Certainly, one of the more unique towns was Helen. It is made to look like a Bavarian town with that fun tourist trap feeling. With some imagination you could see yourself at a Oktoberfest in Germany. When we checked the history of the town, what was really interesting was; that there is no real German heritage in the town. It seems that in 1968 the town was having severe financial problems and a local artist, who was stationed in Germany, came up with the idea of completely redoing the town in the Bavarian motif. So the whole town was redecorated to look as it does today to attract tourists and it seems that it was a very good plan! I thought of Judy when I saw one of the items for sale in a gift store. Very near Helen is the Anna Ruby Falls. Unfortunately, even though it is accessed via a state park, the falls sits in a federal forest and was closed. So we opted to tour one of the oldest Georgia State Parks-Vogel. It consists of a recreational lake, hiking trails and a campground. We enjoyed a hike around the lake and toured the campground. The campground is very tight but has many level sites. If arriving in a big rig, be prepared for a few squeaky spots. Today, we paid a second visit to Vogel State Park and then visited with Karen and Al at their park. We had a great visit with them, and solved all the world problems. We hope to be back in this area in the new future and may be able to stay at this private owner park. If we time it right, we may even get to use one of their spots. Once again, I failed to get any pictures of our visit. This is getting to be a bad habit. Next stop is time for a family visit.